Mobile’s contribution to holiday shopping, in terms of both visits and sales, has been growing every year. But the 2017 holiday shopping season will hit a new milestone: for the first time ever, mobile visits to retailer’s websites are expected to surpass desktop visits during the months of November and December. Consumers shopping from the desktop will continue to account for the majority of retailers’ sales dollars. But mobile is making inroads there, too. According to a new forecast from Adobe, desktop’s share of revenue is projected to be 66 percent, down 6 percent year-over-year. Meanwhile, smartphone revenue will have climbed 26 percent over last year to account for 24 percent of revenue; and tablet is down 9 percent from last year, to account for 10 percent of revenue this holiday season. The data from Adobe’s holiday shopping forecast leverages its artificial intelligence and machine learning framework Adobe Sensei to identify retail insights flowing through Adobe Analytics. Adobe Analytics measures 80 percent of online transactions at the largest 100 U.S. online retailers. The new forecast is based on an analysis of one trillion visits to over 4,500 retail sites and 55 million SKUs, the company says. Mobile’s overtaking of the desktop should come as no surprise. Last November, mobile internet use topped desktop for the first time ever. And during the holiday shopping season, several of the top U.S. retailers reported record numbers of mobile shoppers. For instance, Amazon said that its mobile orders on Thanksgiving 2016 exceeded both Thanksgiving 2015 as well as Cyber Monday 2015. Walmart had noted that 70 percent of its website traffic around Black Friday came from mobile. Target had even said that mobile accounted for over 60 percent of its Black Friday pre-sales. But whether it’s on desktop or on mobile, online shopping is outpacing in-store sales. 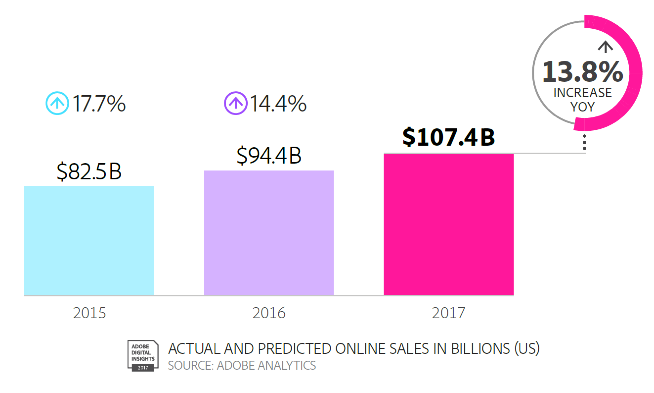 This holiday season, Adobe is forecasting online sales to reach $107.4 billion, up 13.8 percent from last year, and topping in-store retail by 10 percent. Cyber Monday will be a huge contributor to those sales, and is on track to become the biggest online shopping day in U.S. history with $6.6 billion in online sales, a 16.5 percent increase over last year. Thanksgiving sales will also climb by 15 percent to reach $2.8 billion. During the five-day period between Thanksgiving and Cyber Monday, U.S. consumers will spend $19.7 billion. Larger retailers (those with over $100 million in annual revenue) will see higher order values than smaller ones, Adobe also said, with $171 vs $90 on desktop, $162 vs $77 on tablet, and $141 vs $71 on smartphones. However, they’ll have slightly smaller mobile conversion rates, at 1.6 percent vs 1.9 percent for smaller retailers. Adobe additionally predicted some of the hot buys this year, including Hasbro NERF guns, Nintendo Switch, Apple AirPods and Sony Playstation VR. Other popular items will include Amazon Echo, Google Home, and Super Mario Odyssey, along with new versions of 2016 best sellers like Shopkins and Hatchimals. The best deals will be found on Black Friday, when TVs will be 23.7 percent off, on average; tablets 23.6 percent off, jewelry 12 percent, and appliances 17.7 percent. Adobe’s full forecast is here.